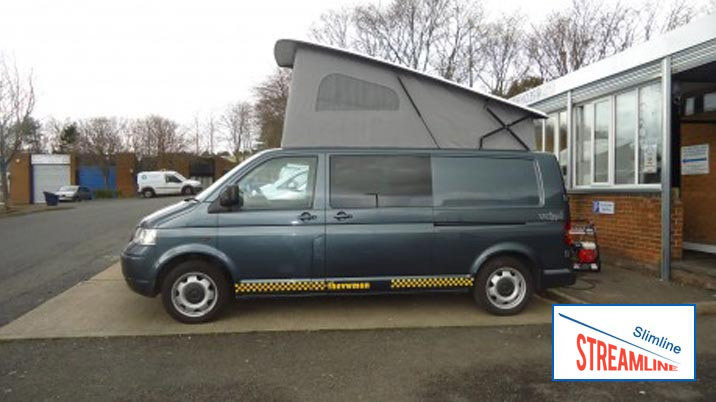 The Slimline campervan roof is one of our best sellers due to its streamline appearance which hugs the existing roof profile while mantaining a clean, attractive profile. 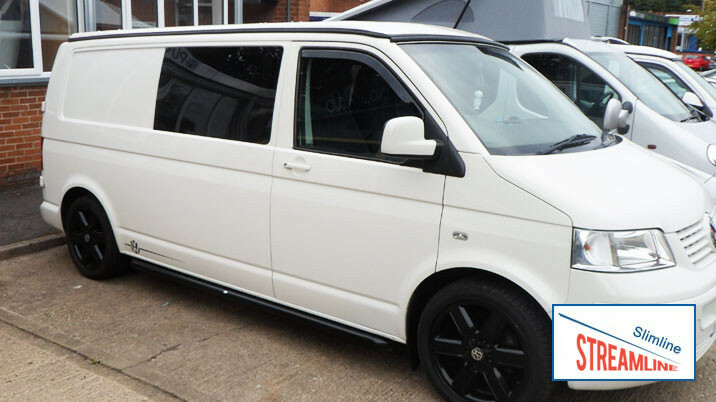 As with all our roofs, quality of manufacturer is still a key requirement for our customers so the Slimline campervan roof is not only visually appealing but also robust and functional. 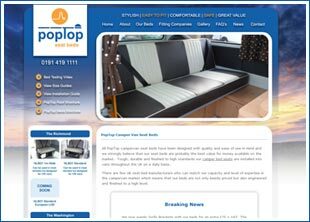 Similar in many ways to the Streamline Super High Lift, Low Profile campervan roof, the Slimline roof has a similar low profile with a higher than standard lifting roof. The overall width and height of the tented area is smaller than the Super High Lift, Low Profile however there is still adequate room for the majority of users. 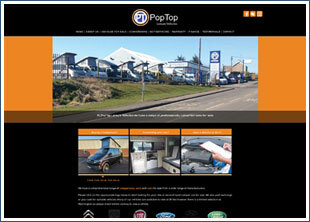 The Slimline campervan roof is available for both LWB and SWB vehicles. 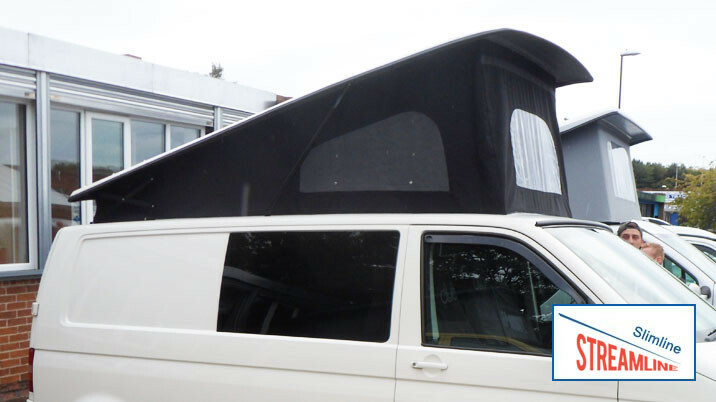 Our Slimline campervan roof is hardly visible unless you know what you are looking for and it closely matches the shape of your van ensuring minimal wind resistance while maintaining the original profile of the vehicle. 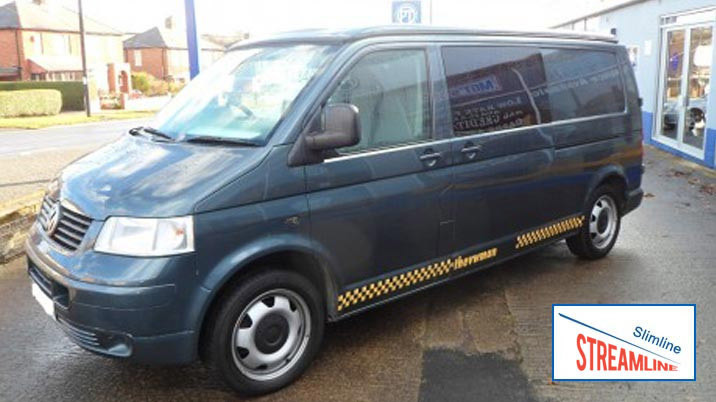 There is a slight increase in the roof profile which ensures that head room within the vehicle is maintained when your Slimline campvervan roof is retracted. If you want the absolute maximum standing room and tent space then you may want to consider our Super High Lift, Low Profile campervan roof however the Slimline offers plenty of standing space in the areas that you need it with its higher than standard elevating campervan roof. 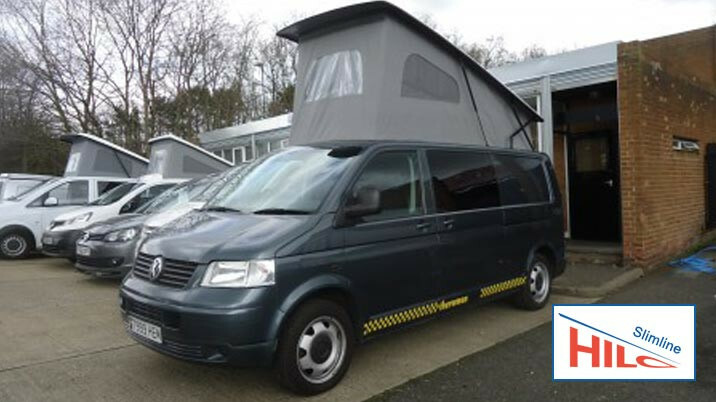 Some customers feel that the Super High opening campervan roof is excessively high and prefer the more compact Slimline which is also higher lifting than standard. The Slimline is a fully reinforced roof along its full length meaning that it is more than strong enough to accept all rail/roof rack systems. You don’t need a degree in Engineering to put our Slimline roof system together!. 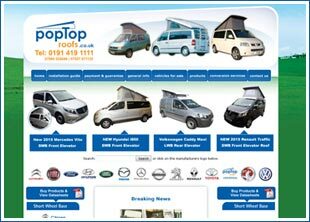 Can be fitted far easier than most high lifting, low profile roofs from other campervan roof manufacturers and with a minimal delivery lead time. Our Slimline campervan roof comes in Grey as standard however you can choose from a range of colours and alternative canvasses for an additional £150 + Vat.